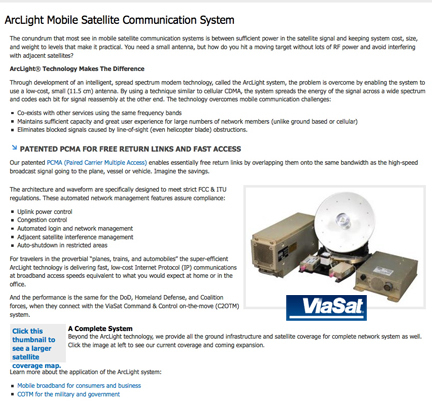 [SatNews] ViaSat Inc. (Nasdaq: VSAT) has completed operational testing of an airborne intelligence, surveillance, and reconnaissance (ISR) satcom system that is providing transmission of 4 Mbit/sec through a high-speed return link off the aircraft. The tests were conducted during live missions on a U.S. Special Operations Command (USSOCOM) C-130 aircraft operating in Afghanistan using an upgraded ViaSat ArcLight® satellite system. USSOCOM is continuing to fly daily missions using the new system. The upgrade was a simple modem replacement on the aircraft, which was already equipped with a previous generation ArcLight modem and ViaSat VR-12 11.5-inch Ku-band antenna. Using the same antenna, the link achieved data rates of 4 Mbps, transmitting full motion video from the aircraftto a hub also located in Afghanistan. The new modem has operated at up to 10 Mbps at Ka-band using the Ka-band version of the VR-12 antenna, but to match video encoders already on the aircraft, live mission flights typically operate at 2.5 Mbps air to ground.